On a hot morning, my class rode in an old bus to the Alamo. It was not as exciting as I had imagined it to be. In my mind, the Alamo would be big, sitting out in the middle of the desert. In reality, it seemed quite small, dwarfed by the large, city buildings all around it. We spent time inside, taking a tour. There were a lot of flags and glass boxes that contained historical items. The Alamo visit was followed by a picnic lunch, and then we were on our way to a bakery. As the bus parked in front, the smell of fresh bread hung heavy in the air. The tour guide walked us through the kitchen, and we saw each step of the baking process. With promises of fresh bread when we returned, we walked across the grass to the old, original bakery building, and waited in the hot sun while the iron door was unlocked. Inside, there were large ovens and a few long, wooden tables that had been left behind when the transition to the new building was made years earlier. The tour guide shared the history of the buildings and business. I'm sure I would find it all fascinating today, but at four years old, I only had eyes for the spiral staircase in the corner. "Are we going to climb up that?" I whispered to my friend Maria, gesturing to the staircase. She answered with a shrug. I stared at the big ovens, imagining fires burning and bread baking - imaginations made easier by the smells floating through the air from the building next door - until the word "staircase" quickly brought me back to reality. We would be going up. Maria and I grinned at each other as we waited our turn to climb the stairs. Halfway up, I reached out my hand to touch the wall, and green paint flaked off onto my fingers, revealing the white stucco underneath. We found the top floor to be empty, except for several wooden chairs. The ceiling was low. This did not bother me, as I was quite short (the way four-year-olds tend to be) but I noticed my teacher was slumping over just a bit. We walked across the room to the exit, and instead of another spiral staircase, there was a hole in the floor with a ladder leading down to the room below. One by one, we climbed down the ladder. I followed Maria, careful to not let my fear show through as I placed my foot on the first rung. "Hurry up!" I heard a small voice call out, above me, but I ignored it, and moved slowly down the ladder, breathing a sigh of relief when I reached the safety of the ground floor. We returned to the bakery for our promised bread, fresh out of the oven. Eaten outside, under the shade of a large tree, the bread was so warm and fluffy, it nearly melted in my mouth. We piled into the bus, each holding a loaf of fresh bread to take home, and headed back to the school. When my mom picked me up that afternoon, and asked how my trip to the Alamo went, I answered her by announcing that one day I wanted to live in a house with a spiral staircase and light green walls. School trips. We all go on them. What trip do you remember the most? Write a memoir post about a memorable school trip. Do you have a favorite memory of a class trip? OH, I love this. You capture the details...from the flaky paint to that amazing smell with such skill. And oh my, do I ever adore your child's point of view. Staircases ARE the coolest things in the world, especially when they are spiral. I remember feeling that so vividly. I LOVE this! Also, I LIVE IN SAN ANTONIO! Such great description of how you felt being there and what you took away. Well I am kind of let down that the Alamo is not a huge sight in the middle of nowhere that looks great even. Fresh baked bread sounds awesome and your visual imagery is getting so amazing. :) Awesome as always, sweet Tracie! I want to feel the wall! Alamo schmalamo. You got fresh bread! Loved this piece! I've been to the Alamo numerous times, only as an adult. It does seem so small in the big city. And fresh baked bread is my absolute favorite! But the spiral staircase part blew me away! When I was 18 and just about to enter the Air Force, I visited a friend who had just gotten married. She and new hubby lived in the cutest apartment I had ever seen (not that I'd seen that many back then). It had a beautiful white spiral staircase from the living room up to their loft bedroom. It was dreamy. I left there swearing to myself that someday I'd have a spiral staircase. Never did. It was a sweet dream though. Thanks for sharing. I always love your stories. I so love how you captured your four-year-old point of view! All of the lovely details- taller than you! This moment in time: "We returned to the bakery for our promised bread, fresh out of the oven. Eaten outside, under the shade of a large tree, the bread was so warm and fluffy, it nearly melted in my mouth." warmed my heart and brought me right there with you. Great post looking through the eyes of your 4 year old self. I love the descriptions of the staircase and the warm baked bread. This is so perfect. I always laugh at class field trips when the kids always focus on what they are not "suppose" to be focusing on. Love it! What an amazing memory you have! This trip obviously left quite an impression on you. I had to laugh, though, because I've taken that bakery field trip before---as a parent chaperone! LOL! We just left San Antonio two and a half years ago after living in that wonderful city for nearly thirty years. We, too, were surprised at how small it was when we first moved there. Still, quite an incredible building with a history to match. Well done! I love reading your memories. Seriously, you make things seem so beautiful in their...realness. I could almost smell the warm bread baking! I would love to see an old bakery and what would be even better is if someone took one of those old bakeries and used it! Now I am craving carbs----and want to go to MY favorite bakery! What a beautiful, simple story, love the child's POV, too. I've been to the Alamo before, but I think I was about 10 when I went. I can't imagine taking a group of little ones there and expecting them to learn much---but it's clear you had a ball and your memories are still so vivid! I remember thinking that spiral staircases were magical- like something out of a fairy tale. 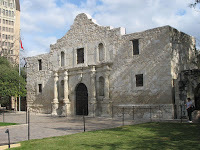 I was 20 years older than you when I first saw the Alamo and I had the same feeling! I love the details here. Ah, the magical spiral staircase. They are truly an amazing thing for a child. Loved this! What a lovely post. I felt like I was right there with you. I loved the little details--they made such a difference. And spiral staircases were totally fascinating. I still like them! Now I want to live in a house with a spiral staircase!! Um, am I the only person who thinks of Pee Wee Herman when they see the Alamo?! Great story and trip down the memory lane. I love going on school trips with my boys. I remember how much fun and excitement it was when I used to go on them when I was in school long,long time ago. You are making me so homesick for San Antonio! I still love visiting the Alamo whenever we go home for a visit. Sadly, I don't think I was ever able to make that bakery trip. (I'm assuming that was the Butter Crust Bakery). We moved schools the year our little school would have done that trip. Your descriptions were beautiful and allowed the reader to go on the trip with you. Thank you Tracie for sharing. Blessings. Great description! Fresh bread is my favorite. It's so warm and so good. I guess I'm weird. Spiral staircases kinda freak me out. I mean, I like the way they look, but walking on them is a different story. It's like you don't know where the next step is coming from. I think I went on the same field trip! I also thought the alamo would be bigger! 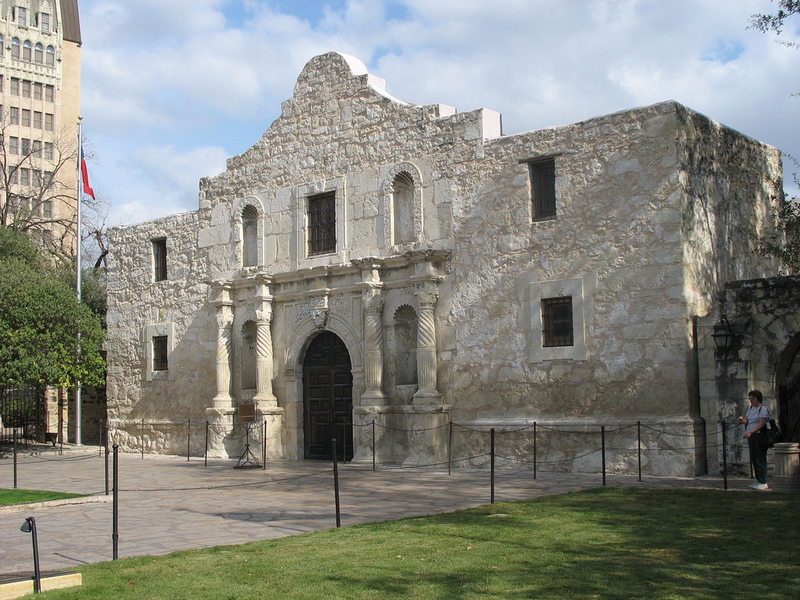 My very first home was stucco and was designed like the Alamo. It was a very small house. And yet, there is nostalgia in it. I thought the Alamo would be in the middle of the dessert. I can't believe there are skyscrapers and buildings around it. I want to see it, but not like that.